Let's start with dessert. Friday was the 7 year anniversary of my mom's passing. All weekend I wanted to make one of her recipes. On Thursday night I was reading Living the Gourmet blog entry entitled Green Apple Cobbler. It reminded me of my mom's 4 Egg Cake. Finally today I baked the cake. 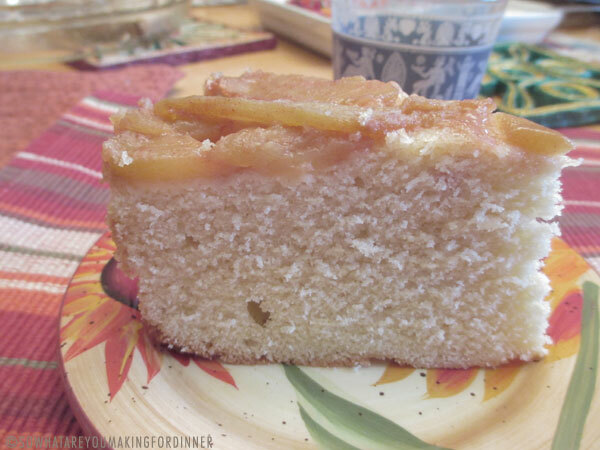 I used my Mom's 2 Egg Cake recipe and used the Living the Gourmet recipe for the apple topping. How was it? Oh it was good. It was really, really good. The sauteed apples were not too sweet. I know my Dad would have said it needed vanilla ice cream, and yeah that would have been a nice addition. From a recipe card in my mom's recipe drawer. Topping from the Living Gourmet. Blend shortening, sugar and eggs. Stir in dry ingredients alternate with milk and vanilla. Peel and slice the apples. Heat a large frying pan on low with the 2 tablespoon of butter. Place the sliced apples in the pan add the lemon juice and dust the apples with the brown sugar and cinnamon. As soon as the apples are coated remove from the heat. 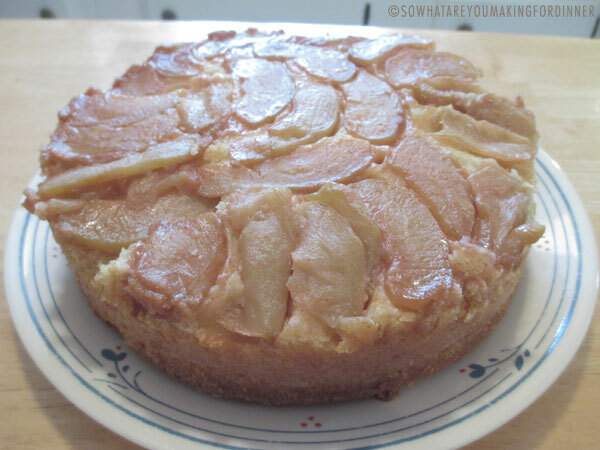 Butter an 8 ½ inch baking pan and place the apples on the bottom. Gently loosen the edges with a spatula and place a serving plate over the pan and turn over. Mine did stick a bit on the sides, just one side, the side that is not in the photo! Steak and Cheese Pie. Actually Steak, Onion and Cheese Pie. I had some Pate Brisee with Pepper in the freezer from the Easter Meat Pies. I sauteed the onions and steak. 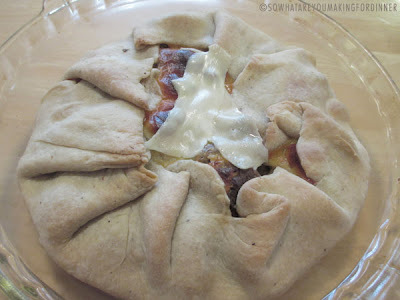 Rolled out the crust and added the steak, onions, some Provolone and American Cheese. Best part about this was the crust. And the side dish, or what am I eating for lunch this week. 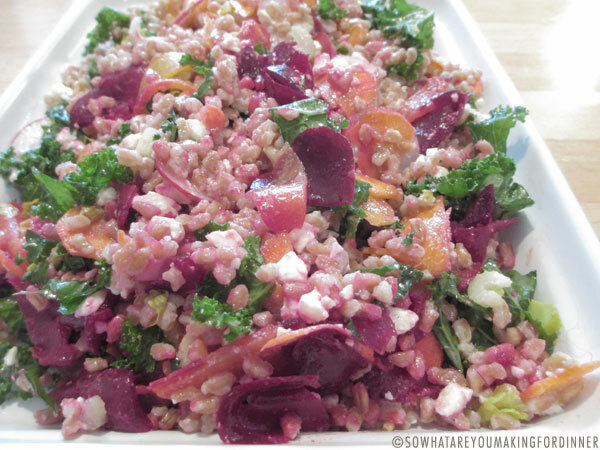 Farro Salad with Spring Vegetables and Feta. Yeah that was good too! But the recipe said 2 serving. 2 servings for 3 days! This got a good review from Chris. The dressing so basic but it is all the dish needed. To a medium saucepan, add the: Farro, Vegetable broth or water. Bring to a boil over medium-high heat, then reduce the heat to medium-low and stir in the: Dried bay leaf, 2 teaspoons kosher salt. Simmer until the farro is tender, about 20 minutes. Transfer the farro to a fine-mesh sieve to drain off any excess water, then turn it out into a medium bowl. Remove the bay leaf and discard. To the cooked farro, use a wooden spoon to stir in the: Torn kale, Shaved radishes, Shaved carrots, Sliced celery, Celery leaves, Crumbled feta cheese, Chopped tarragon, Lemon juice, Extra-virgin olive oil. Then gently fold in the: Shaved beets.